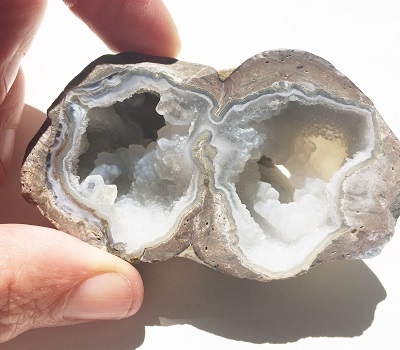 Lovely earth toned with patterns of blue grey and cream colored banded agate with a pair of sparkly grey druzy pockets, natural Thunderegg from Mexico. 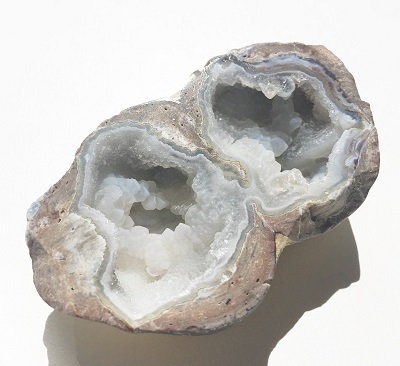 Thundereggs are grounding, soothing and calming stones that create emotional, physical, and intellectual balance. Thunderegg will aid with centering and stabilizing physical energy. Thunderegg harmonizes the yin and yang, the positive and negative forces that hold the universe in place. Thunderegg helps to build self confidence and self-esteem. Thunderegg enhances mental functions, improves concentration, perception and analytical abilities. Thunderegg may help one overcome negativity and bitterness of the heart. 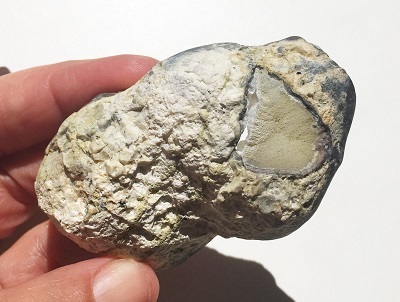 Thunderegg shows what your emotional state has been in the past and other lives and teaches you to take responsibility for your emotional being and encourages positive behavior. Thunderegg helps to release anger and fosters love and the courage to start over. Thunderegg fosters community awareness and rightful actions. Thunderegg may be helpful in linking one with other like-minded people. The beautiful interior star or flower shape of banded agate may provide a link with “star people” on this planet and from other realms. In healing, Thunderegg is a powerful throat healer. Thunderegg counteracts blocked self-expression releasing shoulder and neck problems, thyroid deficiencies, and throat and lymph infections. Thunderegg lowers fever, treats arthritic and bone deformities, supports the skeletal system and may be helpful in healing fractures.